Health specialists check for radioactive materials from the earthquake and tsunami in March 2011. SAN LUIS OBISPO, Calif. – It’s an unseasonably warm day, and Avila Beach is packed with sunbathers and tourists. Scott Milner attracts more than a few curious glances as he steps onto the beach holding a Ludlum radiation scanner and proceeds to take background readings next to the pier. Milner is an environmental health specialist with San Luis Obispo County. He is in Avila to prepare for an unwelcome invasion that is expected to occur on county beaches over the next couple of years. In fact, the invasion has already begun. On March 9, volunteers with the Environmental Center of San Luis Obispo were conducting a coastal cleanup at Montana de Oro State Park and found a yellow plastic bottle with Japanese letters embossed on its base. That was the first of what could be a considerable amount of debris from the devastating March 2011 tsunami in Japan to wash up on San Luis Obispo County beaches. With that in mind, county officials are setting in place procedures to safely handle the debris, including determining whether any of it is radioactive. “Any debris would have to be three times more radioactive than background levels to be considered hazardous,” Milner said. When a massive earthquake and tsunami struck the northwest coast of Japan in March 2011, an estimated 5 million tons of debris was washed into the ocean. Japanese officials estimate that 70 percent of it sank to the bottom of the ocean. But the rest is drifting inexorably toward the West Coast of the United States, driven by winds and currents. The bulk is expected to start washing ashore in the fall and continue through 2015, state and federal officials say. This debris could fall into five categories — litter and small marine debris, hazardous materials such as drums of toxic chemicals, large debris such as boats and docks, personal possessions and even human remains. County environmental health officials have produced a draft six-page plan to coordinate response activities. Radioactive debris is of concern because the tsunami caused reactor meltdowns at the Fukushima nuclear power plant. However, the danger is thought to be minimal because the reactors melted down after the tsunami had washed the debris out to sea. Debris that has already arrived on beaches in the Pacific Northwest has been tested, and no radioactive contamination has been found. As a safety precaution, the county Department of Environmental Health Services is conducting baseline radiological testing on the county’s 23 most popular beaches from the Oceano Dunes north to Hearst State Beach. Each of the 23 beaches will get background readings at three locations, Milner said. Normal background radiation levels in San Luis Obispo County range from 10 to 20 microroentgens per hour, which is well within normal and safe levels. 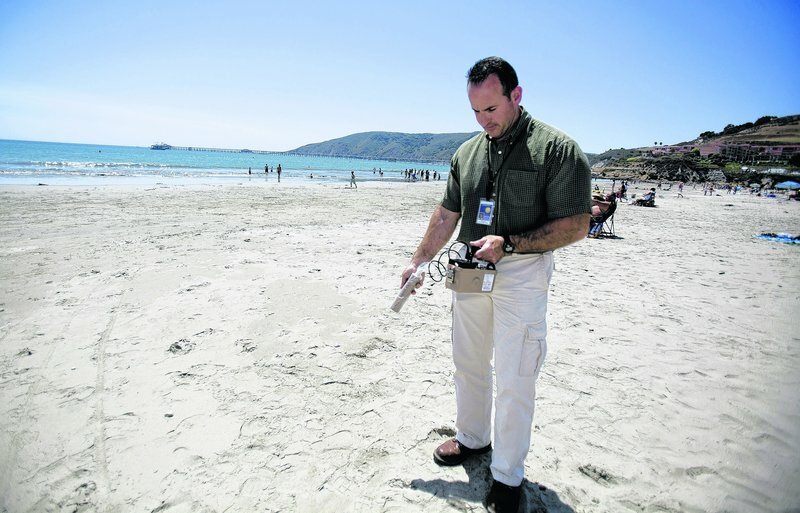 Any debris found on area beaches will be tested to determine whether its radioactivity is above background levels.